Dreaming of spring color? Here’s the drill: Buy hardy bulbs now and plant them before the ground freezes. Get the job done fast and efficiently with these tips. Clear a Spot. If you’re searching for spaces to tuck in bulbs, focus first on fall garden cleanup. Open area will be revealed when you pull out spent annuals and cut back perennials. Choose a Tool. Dibbles and trowels are good for digging individual holes for small bulbs. An auger attached to a drill will reduce fatigue and save time if you have many holes to dig. Use a shovel to excavate one hole for a large clump of a dozen or more bulbs. Dig the Right Depth. Plant bulbs at a depth three times their height. 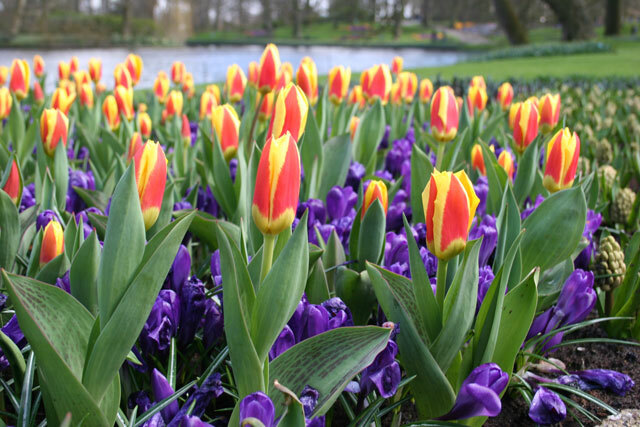 Tulips and hyacinths should be 6 to 7 inches deep, daffodils, 8 inches deep and crocus 3 inches deep. Bury the Treasure. Make sure the growing tip is pointing up. Cover with soil and water. Spread mulch over the top to prevent heaving from freezing and thawing.